With the finals set to start in , now is the best time for a recap of the semifinals. Both series were highly anticipated as Killer went up against Sea while by.hero fought PianO. The games were all exciting to watch with lots of back and forth plays to create some very tense moments regardless for who you are cheering for. Game 1: With cross spawns on FS, Sea went for a greedy opening with an inbase 14cc before getting his rax. Killer opened with a hatch first into pool build adding another hatchery and gas soon after for mutalisks. Deciding to be aggressive, Sea moved out with 4 marines but lost them doing no damage. Constant mutalisk harass by Killer kept Sea with a reduced SCV count at his natural as Killer opted for hive. 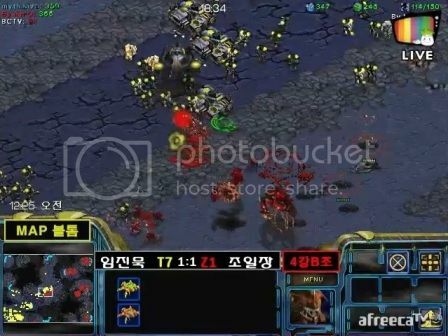 Sea decided to go for SK Terran gathering up a massive force to storm Killer's natural though Killer managed to easily hold (pic). Though he held, Sea took down his third and looked to be in the lead. Channeling his inner Jaedong, Killer double expanded massing a large crackling/ultralisk army and pummeled Sea's army though the Terran did not flinch as his macro at home meant another big army was on its way. After taking down Killer's fourth base, Sea marched to the third but was surrounded near the ramp losing his entire army and the game. Game 2: Having lost the first game, Sea went for a safer opening in rax first. Killer opened with a 12 hatch. He added the pool soon after with another hatchery and gas. Sea ended up getting a cc on the low ground with only 1 rax as he got a factory. In what can only be described as a great read of his opponent (likely read the amount of marines), after getting his lair, Killer went for mass zerglings. Sea was not prepared at all as his marines got surrounded and killed with more zerglings arriving for the gg. Game 4: Both players opted for safe builds with pool first from Killer and rax first from Sea. Killer double expanded soon after grabbing his inbase mineral only and his natural. The game entered a lull with both players choosing to macro up rather than engage. Killer double expanded again grabbing a 4th and 5th while Sea took his inbase expansion to get a third. Soon after, both players engaged in the center many times. Killer went for a crackling/hydra/lurker/defiler combination using plague to help one shot marines as Sea looked to keep denying bases but wasn't successful after a while. The plague/hydra combination proved to be strong as Sea kept getting pushed back. At this point, Sea took a page from PianO's book going for a double drop while also attacking Killer's 5th with his main army. Killer counter attacked Sea's 4th but with enough army at home to hold, Killer gg'd out. Game 5: Game started with Sea playing safe with a 1 rax FE while Killer opened with hatch first into pool. Sea eventually moved out with a small force using it to gain some map control. He tried to combine this army with the one at home looking to take down Killer's third however Killer managed to catch half the army killing it easily then saved his third as well defeating the whole army. Not to be deterred, Sea macroed up another big army to take down the third but was denied by Killer with a clutch dark swarm. As Sea made his way to Killer's expansion, guardians morphed behind his main prevented him from mining at his expansion. He cleaned up the guardians eventually and even took a 3rd and 4th transitioning to mech. Killer would not make things easy though as his constant attacks on multiple bases combined with drops kept Sea defending. He would eventually be unable to hold on against the wrath of the swarm tapping out to give Killer the series, 3-2. Game 1: In order to set the stage, PianO opted for a bunker rush. hero looked like he was holding on until he lost several drones, retreated and was unable to prevent the bunkers from going up losing him the game. Game 2: With cross spawns on CB, both players went for safe builds. hero opened with pool first into expansion to PianO's rax FE. Looking to put on some pressure, hero made some zerglings but was repelled by PianO. PianO opted for a +1 5 rax build which hero spotted getting a hydra den for lurkers. hero would cancel his third once PianO moved out and went for an attack on PianO's expansion devastating his economy before going back and managing to defend against PianO's army with his mutalisks. With no army left and his eco in shambles, PianO couldn't hold on and gg'd out soon after. That's a lot of marines! Game 3: Looking to set the pace of the game early on, PianO went for a forward rax while hero went for pool first into expansion. 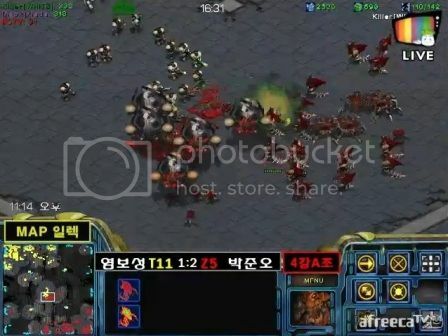 hero made zerglings for pressure with PianO managing to avoid them to get into the main taking down 3-4 drones however things looked bad at home as zerglings broke down a building rax killing many workers before they were cleaned up. PianO started adding vultures while hero added lurkers. hero would contain PianO though PianO still managed to constantly harass hero who was on the defensive. Once mutalisks were out, hero grabbed a third and gained map control. PianO would grab his own expansion after massing up a fearful army and managed to survive the first attack by hero (pic) but the followup attack saw his army dwindle and with his expansion under assault, PianO left the game. Game 4: Spawning at positions 11 and 1, PianO opened with inbase cc adding a rax soon after while hero went for double expansion grabbing his inbase minerals before pool. PianO would add a factory then port going for a marine, vulture and wraith combination for a short duration early on. In the meanwhile, hero morphed a hydra den and spire eventually taking a fourth base. Not much action took place when hero decided to use the back entrance after destroying the psi disruptor. PianO noticed and repelled it then defended against a frontal assault (pic) however he wasn't able to defend the second time hero used the back entrance. PianO decided to attack hero's base instead of turning back. With his army pushed back after defilers were out, his main suffering extensive damage and being unable to defend a crackling assault at his natural, PianO gg'd out giving hero the series, 3-1. With that, our two finalists are Killer and by.hero leading to a ZvZ finals! Both series were fantastically played so you better watch both series! If you can only watch one game from each, make sure it's game 3 from both then! Fighting Spirit, Circuit Breaker, Neo Jade, Blue Storm, Neo Electric Circuit and Match Point. While both players seem to be at the top of their game and have had an amazing performance in the semifinals, the big favourite coming into this finals is none other than Killer. He's looked sharp in all his games making great decisions and clutch plays. His ZvZ record sits at 75% beating players such as HoGiL, Modesty, Kwanro etc... On the other hand, hero is a multitasking beast though his ZvZ record of 48% seems to indicate that he needs to work on the matchup to get it to Killer's level. The last couple of times these two players encountered each other, Killer has won all 5 games against hero. In the 41 Starleague Season, he looked dominant winning 2-0 and knocking hero out of the group in third place. His overall record is 13-8 against hero dating back to 2013. 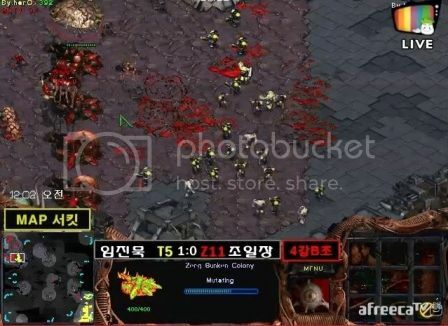 Of course, hero can't be counted out but he's definitely facing an uphill battle against the current best Zerg on Afreeca. Prediction: Killer will take this 4-2 with hero managing to win a game or two. Will hero unseat Killer and take the throne for himself or will he be yet another victim for Killer as Killer furthers establishes himself as the best Zerg that Afreeca has seen to date? (Vote): Killer to further establish himself! (Vote): hero to take the throne! Nice work, unfortunate I missed this thread until after the matches! 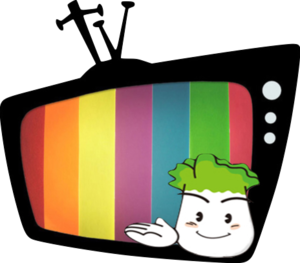 Filco Channel on youtube for fpvs, replays, tutorials and thoughts on the game.